Aggiornamenti... e strips in volume in autunno! The new version of the DieGO Publishing web page is on-line: here. I have made some images for it (the big background and the 4 images for the sections on the main page). Is announced the VOLUME of "V for Villain - How I Met Your Uncle"!!! In the fantasy kingdom of Gorlond a new character has raised from the ashes ... It is not the Dark Knight and even Jesus! But the terrible Vladius Hamsterblood, former tyrant of the region that is now ready to take the fight for the title of Villain! Will Vladius and his clumsy henchmen be able to stretch back their claws on Gorlond or will they be forced to book an extra session to the manicurist? How I Met Your Uncle! 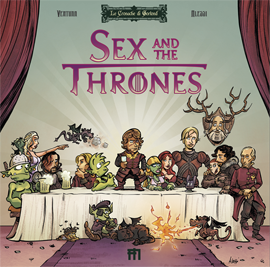 The duo Marco and Alessandro has created a 10 strips parody of Game of Thrones Season 3. The volume will be in stock by Autumn 2013. Il volume conterrà in inglese le strip fantasy-comiche di "V for Villain" e della parodia "How I Met Your uncle".